Korean cosmetics are some of the most compatible make up products to the Filipino skin which is why when Ilearned that Dearberry was coming to Manila, the make up lover in me gave a yelp of joy. Yes, I actually do like make up. I am just too lazy to use it all the time but if you see my make up hoard, I can compete with small time make up artists. Trust me. My first haul are the following: The Dearberry Pore Primer because people have been telling me that it's good for the skin and it will make my face look more flawless. After all, I am turning 36 and I won't have that dewy skin feel soon. I also got the Gel Eyeliner named Online. They should have named it "on fleek" because it was definitely on fleek everytime I put it on. The mascara which is called Must Eyetem which is a pay on must have item. The last one is lipstick of course since I am building my #lipsticklovebyK hashtag. Also, I just really love lippies. The Pore Primer felt good. It wasn't heavy on the skin and it was easily absorbed. I didn't even look like I had primer on. It didn't wash off even when I was sweating under the heat and it definitely did not feel sticky which was really good because that was my biggest fear. There is nothing more icky than a sticky face. The Online gel eyeliner was definitely good. It stayed in place the whole day and did not smudge. Can you imagine going around the city with raccoon eyes you can't get off. When I got home at night, I washed my face and used wipes afterward. It came off pretty easily. The mascara did not clump which for me is the only thing that matters. Lastly FLIRT. I loved that the name of the lippie is flirt and when I put it on, it did make me look ready to flirt, not that I'll be flirting anytime soon. It's not long lasting but it definitely glides smoothly, looks good on the lips, and definitely moisturized. You just need to dab it on again after eating and drinking. Dearberry is definitely going to my list of cosmetics that I will regularly use and buy. You should also give it a try. That pore primer looks interesting! I don't like my pores, and I try everything to get rid of them. Right now I am using Benefit's Porefessional, but it's so expensive so I don't really want to repurchase... Thanks for sharing these new products! I have never heard of dearberry before. I will need to look them up and see what they have to offer. That's an awesome haul. I normally just go for eyeliners and lipsticks! I'd love to try that gel liner, I'm going to try to get my hands on it soon. Thanks for sharing your experience! That is a great name for the lipstick. I'm like you, sometimes I am just to lazy to put it on. I love that Flirt shade, it is one of my favorite shades. 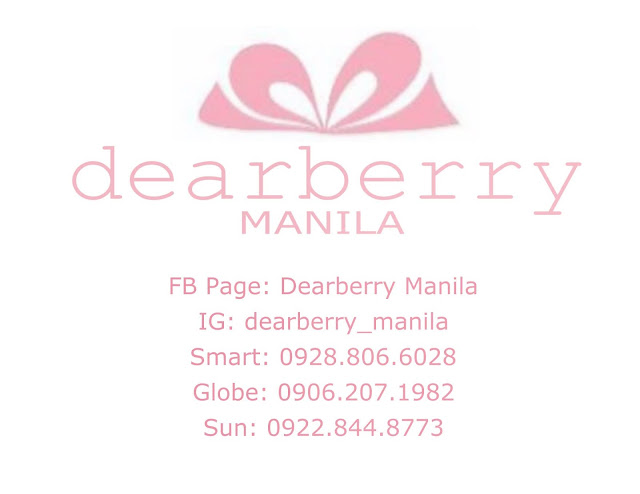 I am so thankful that Dearberry is now in the Philippines! I really appreciate a good primer, so I'm glad to hear about the pore primer. Great collection! I have never heard of dearberry before. but it must be pretty awesome if you're posting about it. I'm glad it came to your area. That's a great haul. My favorite is the lipstick. That is so your color. Korean cosmetics is getting really popular amongst Filipinos...thy must be really goo! Makeup products from south east asia seem to be all the rage right now. I'd love to try some! There seems to be an influx of Korean cosmetics in the country and this is great news for K lovers as they will have more items and brands to choose from. Love that lippie, it looks great on you!